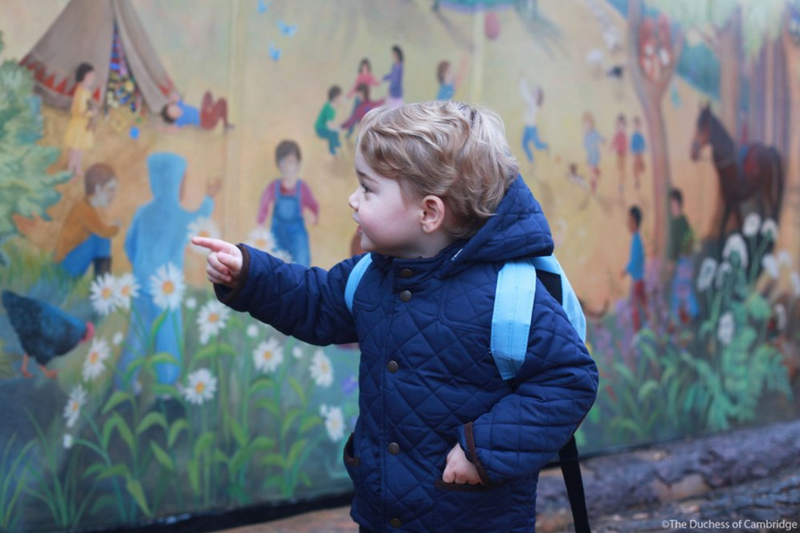 We are back with the first of our annual polls, but first we make a brief detour to share the darling pictures of George on his first day of nursery school. Kensington Palace released two photos of the young Prince on Instagram and Twitter this morning, sending the interwebs into a frenzy. Kate and William took George to Westacre Montessori School, located about 20 minutes from their country home in Norfolk. The Duchess actually took the photographs, here is the second picture. How did things go? Richard Palmer of The Express shared this on Twitter. 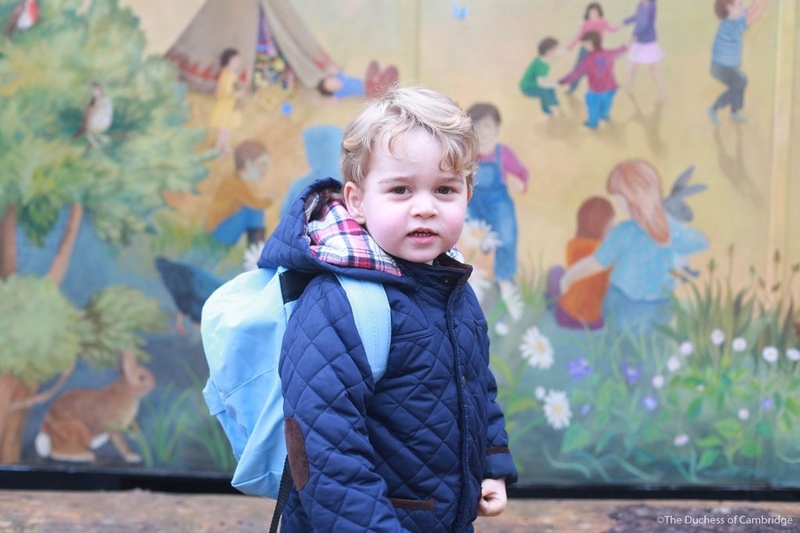 George wore a 2013 quilted jacket from John Lewis and carried a backpack/rucksack that we haven’t yet identified. For all of the details on what George was wearing visit this post at sister site What Kate’s Kids Wore. Now to the first of our polls ranking what Kate wore in 2015. We’ll start today with special occasion and formal dresses, pieces worn for events that are a step above standard engagements for Kate, in styles transcending the business attire we generally see for daytime functions. We begin in May, when Princess Charlotte was born. Kate wore a bespoke buttercup yellow Jenny Packham dress as she introduced her daughter to the world on the steps of the Lindo Wing, and as she was leaving the hospital. 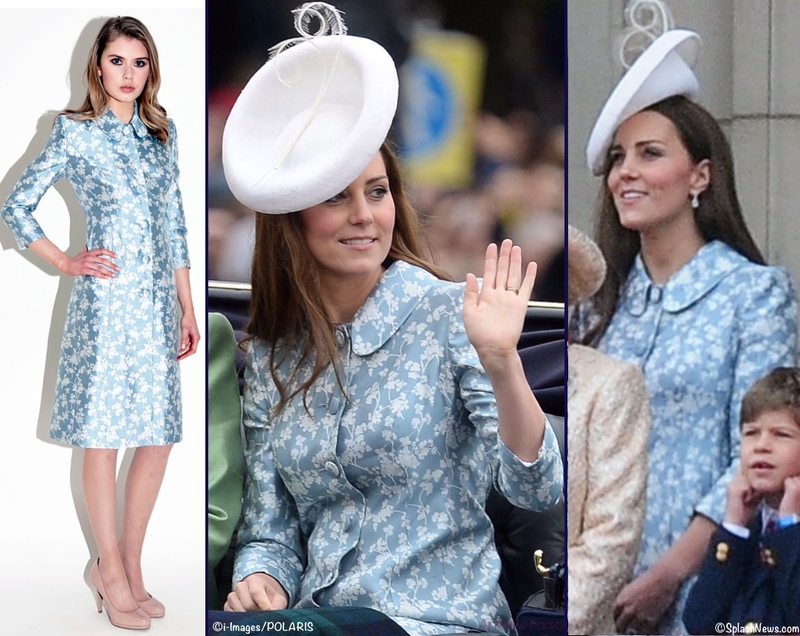 For Trooping the Colour in June Kate returned to Catherine Walker, wearing the Astrid coatdress in a “crisp textured woven ivory and ice blue silk.” The fitted style has a rounded collar, self-covered buttons and princess seams. For Princess Charlotte’s christening Kate wore a bespoke ensemble by Alexander McQueen in ivory silk. The knee-length coat was exquisitely tailored with multiple seams, gores and darts. It showcased wide, winged lapels, a fitted bodice and fuller skirt, and concealed front placket. 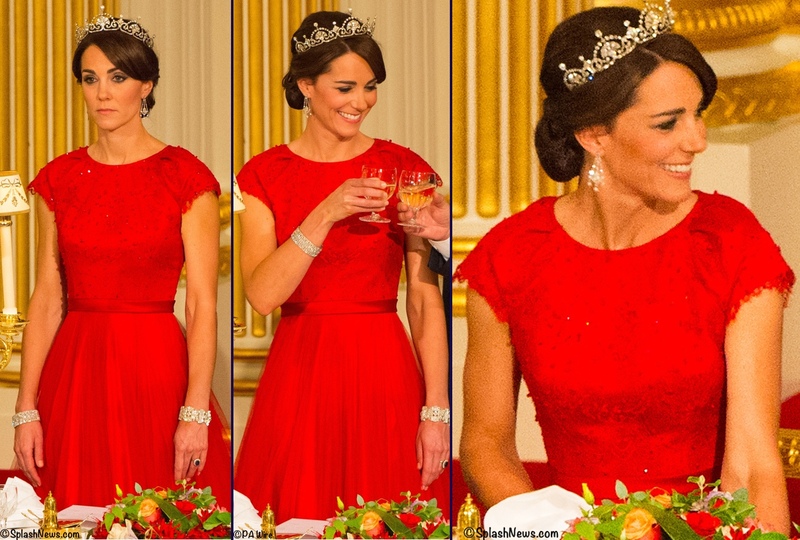 In October Kate attended her first state dinner at Buckingham Palace, wearing the Lotus Flower tiara for that occasion. (More on that in our Jewelry poll next week.) The Duchess engaged in more sartorial diplomacy, wearing a rich red gown for the dinner, the color a nod to the significance of that shade in the Chinese culture. The bespoke Jenny Packham gown features cap sleeves, what looks like a sequin and lace bodice, a satin belt or waistband and a full skirt. We had the delight of seeing Kate in another party frock just days after the state dinner when she attended the premiere of the newest James Bond film, SPECTRE, with William and Harry. The Duchess wore another custom design by Jenny Packham for the gala evening. It featured a crossover halter-style top in the front that was sheer in the back with a slit open from the neck to the waist, the skirt was full with multiple layers. Perhaps Kate’s most debated dress of the year was the Erdem Alouette gown worn to the 100 Women in Hedge Funds annual dinner. The silk gazar dress has some very intricate tailoring, with multiple pieces for the bodice, as well as darts and other details it is difficult to show in the photographs. The print is Erdem’s ‘Ohana Tulip’ design, the garment features a bateau neckline, deep vee on the back and a tiered, gathered skirt. The upper portion of the skirt has box pleats in addition to the gathers. Kate and William joined other senior royals for the Festival of Remembrance in November. 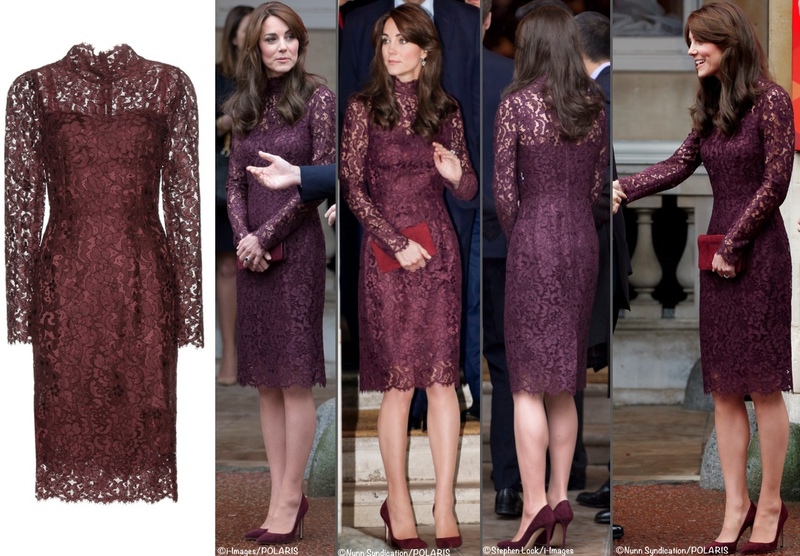 The Duchess wore another lace dress by Dolce and Gabbana, the brand’s black lace midi dress. Very similar to the eggplant style worn for the China state visit, the dress has a floral lace motif, high neck, sheer sleeves and upper bodice, with a scalloped collar and hem. We will be back Friday with more polls, including one on daytime dresses. EDITORIAL NOTE: The post has been edited to remove the reference to Kate taking the pictures with her phone camera. I am unable to find the original information and without substantiation I don’t think the information belongs in the post. I apologize for any confusion the deleted information may have caused. That red state dinner dress was the least flattering thing I’ve seen Kate wear. The color was too bright. The bodice and cap sleeves were very Mamie Eisenhower and the whole effect made her look matronly. Some of her other choices indicate a younger spirit trying to cover it all up with lace, which is totally appropriate, given the role that she is in. But we have to remember that Diana didn’t have any problem baring her shoulders. She looks great in deep jewel tones and is one of the only people I’ve seen who can pull off yellow. But I would probably avoid bright red in the future. It’s just not her color. I know it wasn’t popular when she wore it but I really love Kate’s Erdem dress for being so different from her usual choices. I will always admire McQueen’s tailoring and the christening outfit was a close second for me. I think the Duchess looks great in Jenny Packham as well but other than the bold colour there was nothing really new about the state dinner dress. It was a silhouette we’ve seen before and I was more wowed by the glamour of the occasion than the dress itself. 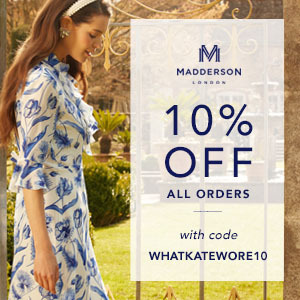 But the Erdem stands out for me in print and colour and of course its silhouette. It may not be the most flattering but it was just so out there that I have to admire Kate’s decision to wear it! And George, what can I say, I will never tire of pictures of the royal children. Cute as always and Kate has a wonderful way of capturing candid shots of her kids. The polls are my favorite!! Very interesting to read the comments about how people picked up their favorite dresses 🙂 I knew the McQueen Christening dress would be on top and deservedly so. Among the special occasion dresses I liked the bespoke icy blue Jenny Packham gown for the Spectre premiere best, too. I found it to be so Bond, so Spectre. I especially liked the colour, the back, the flow, as well as the ethereally diaphanous, quietly timeless, old school feminine, calmly assured quality of the gown – and the wonderfully corresponding chignon. I liked all of the other dresses as well, especially the bespoke yellow Jenny Packham gown for the Lindo Wing with its soft welcoming shower of flowers for a little joy from Heaven. As for the bespoke Alexander McQueen ensemble for Princess Charlotte’s christening: I would have preferred the coat to be slightly more cream in colour to go with the christening gown and would have opted for the coat to be a bit less sailory, with especially the lapels & the neckline being a little softer – thus corresponding to/with the mood of the beautiful hat, (pram), and again Charlotte’s gown. I think that no matter the options, my vote will always go to whatever Alexander McQueen she wears. As the daughter of a seamstress, I cannot help but be amazed at the craftsmanship of their pieces, and as lovely as the other choices as, McQueen will always win. I feel the same way. I don’t think Kate has ever gone wrong with a McQueen creation. Ooh, Jenny Packham or Jenny Packham? It’s between the red State Banquet dress and the blue Bond premiere one for me (although I do love the christening outfit as well). Didn’t like either of the D&G dresses at all. I chose the red State Banquet dress. I actually loved both, but I love the drama of the red dress. It’s just says, “BAM! I’M HEEEEEEEEEEEEEEEEEEEEEEEEEEEEEEERE!” but still being elegant and not trashy like some red carpet gowns. Yeesh.Plus, it has a tiara. I mean, anything with a tiara, right? I wouldn’t want to wear a real one for the world (the plastic ones for ballet were crippling enough), but tiaras are so pretty. I voted for the eggplant D&G lace dress because I think its very pretty,although when the Duchess wore it I didn’t consider it a good look b/c of her hairstyling,which obstructed the mandarin collar. Her worst look was the Spectre premiere dress.The gown looked like a nightie. The coatdress worn at Charlotte’s christening was a piece that I disliked b/c of its collar. The yellow JP maternity dress was fresh and pretty. As for the Catherine Walker coatdress,I actually liked its pattern but the collar and buttons made it look dowdy. The state banquet dinner gown was fine,not a stunner but neither a downer. PS:Shoutout to the WKW team for their hard work! Yay, have been waiting (Im)patiently for the polls to start! Very cute pictures. I actually have a few memories of my own nursery school days, so I’m feeling a twinge or two of nostalgia seeing these shots. I had to pick the McQueen christening coat as my favorite “occasion look,” because none of the rest of the outfits really appealed to my tastes. That coat was elegantly sleek and chic, in my view, whereas everything else in this poll suffered from a certain fussiness in one way or another. I loved the color and fit of the D & G eggplant dress, but the allover lace didn’t thrill me, and I objected to the wearing of such dress in the daytime, given the see-through effect of the upper bodice and the spaghetti-strapped underdress. I look forward to seeing the rest of the polls. And Happy New Year, everyone. I gave my vote to the Erdem gown worn to the V&A on the grounds that I guessed it might not get many supporters. I was heartened to see it didn’t quite come bottom of the table, that privilege being reserved for the poor old Catherine Walker Astrid coat. That one was just too fussy for my own taste. It was hard to pick between the stunning christening McQueen and the floral splash by Erdem but I wavered over whether the christening outfit really counted as a dress and I wanted to vote for one of those! Plus I was so happy to see Kate step outside of her usual restrained palette and go for bold with Erdem, especially with such a superb print. The McQueen, however, is probably a deserved winner of any poll. Lovely to see the pictures of Prince George taken by his Mum, that would make it much more like the first day of any young tot than having official photographers turn up. Also showing him solo avoids the more dressy first days of William and Harry with Mum all done up to the nines. This way Kate gets to hide behind the camera for once — good thinking. I voted for the Erdem also. I love that is was a choice completely out of her comfort zone. The other options felt predictably predictable. I voted for the D&G eggplant lace dress,which I find very pretty,although I didn’t like the Duchess’s overall look at the event b/c of her hairstyle. For me the worst was the Spectre premiere dress,which looked like a nightie. I disliked the coat dress worn at Charlotte’s christening because of its collar. I didn’t have a problem with the Catherine Walker coat dress’s pattern,but the buttons and the collar made it dowdy. The black lace D&G was pretty. The Erdem gown’s pattern was on the fussy side and oh that ruffle. The yellow Packham dress was a pretty maternity dress. As for the State Banquet dinner,the gown was fine,anyway the focus was on the tiara.